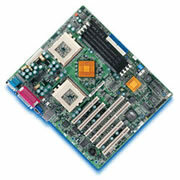 Supports up to 4 GB of PC133 ECC Registered SDRAM memory with 4 DIMM sockets. LSI PCI U-160 SCSI CONTROLLER INCLUDED. Dual integrated ATA/100 IDE controllers.